The sticky, sometimes messy other side to this craving for constructive criticism is that I’ve historically also been my own worst enemy. Judging myself. Beating myself up, down, sideways and diagonally. The chorus of “I’m not strong” or “If only I was skinnier” or “I’m not good enough” has played on repeat in my mind more times than I’d like to admit. And seeing myself in a photo or video? Egads. Talk about a judge-fest. Except that judging myself doesn’t serve me. The stories that go along with these thoughts don’t help me move forward. They do the opposite. They help me get stuck in a narrative that feels like quicksand. And while I’d love to tell you that I never judge myself anymore, I can’t. It still happens. But something else happens too. More often than not, the observer part of my mind takes over. I hear myself saying things like “I notice that I’m telling myself one of my not strong enough stories.” I realize that my thought only has power if I make the choice to listen to it. And then something even more magical happens. I actually start to pay attention to the progress. The lessons. The growth. The feedback. Instead of judgment or failure, I become aware of my body and what it is telling me. I’ve been practicing yoga at least four times per week since November (and more like six days each week since starting my yoga teacher training). I thought that I had a solid high plank position, but I knew that my chaturanga dandasana (high plank to low plank) could benefit from some work. I had a feeling that I was muscling through it instead of truly engaging my core, and I figured that if I was going to eventually try to guide others through this flow – I should be able to both demonstrate it correctly and be able to speak to how the pose should feel, especially for beginners. So I scheduled a private session with one of my teacher training coaches. And wowza. I knew that I’d been cheating...but based on the quiver of my muscles as I lowered my body from high to low – I realized that a whole new world of strength was about to open up to me. Also? I came to the conclusion of how much more strength I really needed. We even videotaped me going through the vinyasa flow so that I’d be able to practice at home, with the correct cues for my body. And then came what would normally be my bury-my-head-in-the-sand trigger...watching it on video. Except that, I didn’t bury my head in the sand. I didn’t cringe at watching my very thick self in only a sports bra and yoga tights (so that we could see what my shoulder and shoulder blades were doing). I didn’t think I was a failure for not having learned proper abdominal engagement after all these months. Instead, I noticed the feedback that my body was giving me. The clues that could help me learn. The progress that I was making by getting up close and personal with my body and my practice. And the crow pose that I’d so happily learned to fly in a few months ago? Yup. You guessed it. I was muscling through that too. A week ago, I’d been proud of getting my feet higher in the pose, but today, I went back to basics. Feet still on the ground. Focusing on the setup and then engaging my core to create the lift. A lift that was minuscule. But instead of focusing on the lack “air time” and telling myself I was starting from scratch – I felt strong. Purposeful. I felt the progress in my body awareness – and that felt like a HUGE win. It boils down to this one simple truth: judgment doesn’t allow for growth. It doesn’t allow for feedback, progress or determination without expectation. But having an intention? Knowing your purpose? 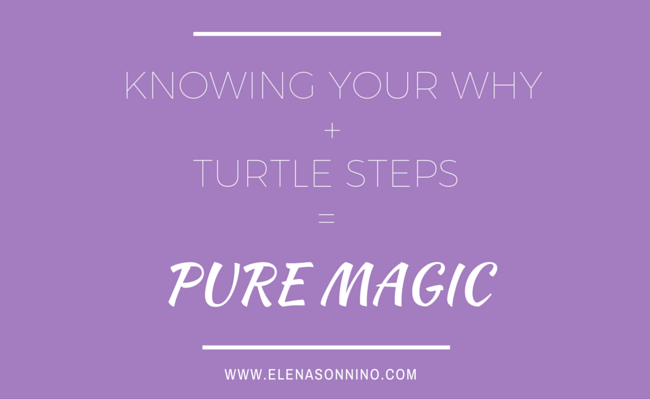 Building on a solid foundation, one turtle step at a time?